Growing up in India, Dr. Laalitha Surapaneni watched the number of heat waves grow. They got more intense. And the beach stalls in her coastal city had to be moved inland when the shoreline began to encroach as the seas rose: All of them were effects of climate change. "It was always there," she said. Years later, when she moved to the U.S., the effects of climate change started to show up in her day-to-day work as an internal medicine doctor. In Baltimore and Minneapolis, it took the form of air pollution made worse by higher temperatures. In Bemidji, Minn., colleagues told her they were seeing Lyme disease cases show up earlier in the year. Meanwhile, the scientific studies showing a link between climate change and a range of health problems piled up. "You put it in any situation, you tip the scales, essentially," said Surapaneni, who is among several experts scheduled to speak before a state House committee on Thursday about the effects of climate change in Minnesota. The House Energy and Climate Policy and Finance Division is new this year, and it's expected to hear legislation this session aimed at reducing Minnesota's greenhouse gas emissions. But first, it's putting lawmakers through a sort of climate change boot camp, which started on Tuesday. Thursday's hearing will be part two. 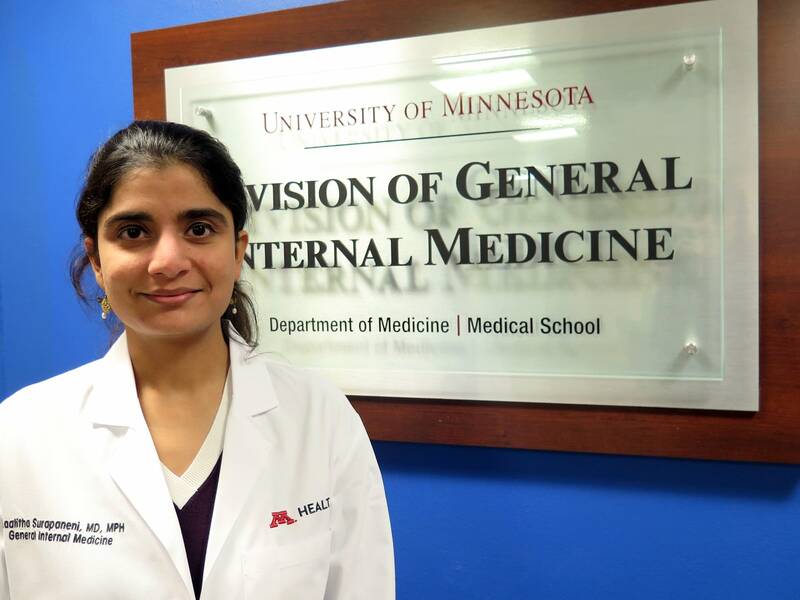 It will also be Surapaneni's day off after working five straight 12-hour night shifts at the University of Minnesota Medical Center in Minneapolis' East Bank neighborhood. "This is what I do in my free time," she said. She's also a member of a group, Health Professionals for a Healthy Climate, which advocates for policies aimed at addressing climate change. "It's not just for the environmentalists, right? The damage that we're doing to our climate is going to impact us all," she said. Higher temperatures have extended Minnesota's ragweed allergy season. And in cities across the country, higher temperatures make air pollution from factories and vehicle tailpipes worse by making ground-level ozone. "You release all of these pollutants that essentially bake together in the sunlight, and when the temperature is high, more ozone is formed," Surapaneni said. Ozone triggers asthma and other respiratory conditions. Surapaneni said studies have shown that hot days result in more emergency room visits for asthma attacks. "If they come into the hospital, I can give them inhalers, I can give them medications, and they'll feel better," she said. "But then they'll go back and breathe that same polluted air that's going to put them back in the hospital." That reality has pushed her toward advocacy for policies aimed at reducing air pollution and slowing down changes in climate, "because that will create change that will keep my patients out of the hospital," Surapaneni said. In addition to her testimony Thursday at the state Capitol, Surapaneni is planning to travel to Washington, D.C., later this month to speak at a public hearing on air pollution regulations the Trump administration has proposed rolling back. As part of the trip, she's making appointments with members of Congress. Surapaneni said she's hopeful that the state can make progress in addressing climate change. For example, she said, Metro Transit recently proposed transitioning its fleet to all-electric buses, which would both reduce greenhouse gas emissions and diesel exhaust in neighborhoods already seeing higher asthma rates. "When your kid has to miss school because of an asthma attack, that definitely makes it more real," she said. "People are working together to find solutions locally."